There is no doubt in hell that the electronic music scene wouldn’t have been what it was last year without the masterful works of the Berlin based Objekt. 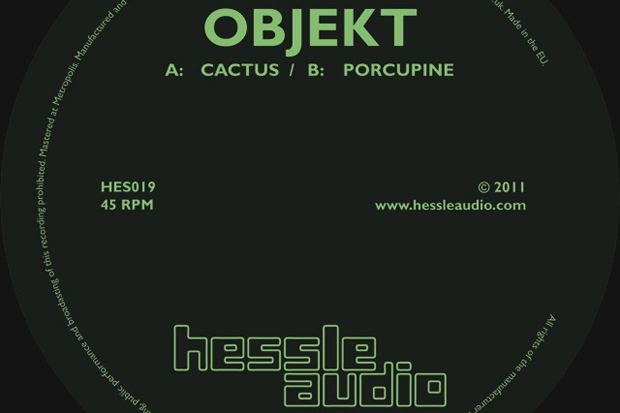 Next week we see the release of the highly anticipated Cactus/ Porcupine for UK label Hessle Audio’s 19th release. This release was set for Objekt’s third white label, but deservedly, the Hessle boys couldn’t let this one go. Both sides of this record are pretty ridiculous with “Cactus” being a cert for setting any dance-floor on fire. The technicality of them drums and the depth in that dubstep fuelled bass just says it all. On the flip, “Porcupine” is a more tech-repetitive, turbulent banger, dosed with an overly impressive drawn-out bassline. I personally deem this as an untouchable release. This is a musician that, in my opinion, has upped the ante of innovative production levels in the electronic underground and has found a more than decently matched imprint in Hessle Audio – a label who are up there with a few others, pretty much running the show. Cactus/ Porcupine drops Monday 16th January on Hessle Audio, available as 12″ and digital. You can stream clips of the release on the official Hessle Audio website now. Huge props to Pinot for this article – objekt is an artist that never ceases to amaze me with his originality, weight and pinpoint accuracy. I’m a huge fan of his and will definitely cop the 12″ after stumbling across the leaked mp3. I love to support good music by buying it on vinyl – don’t sleep on this one!